About the Book: This book offers a heart-filled and radical departure from the usual self-help books that attempt to assist you by mentally repairing your problems. Fierce Innocence shows you instead, how to drop the "problem" mind itself, the one which sees everything through a filter of fear. In an easy step-by-step process, we learn how to use the ferocious energy of tough love on ourselves, to cut through the habitual clinging to the imaginary fearful one, as Paula conveys her heartfelt and totally practical method for calling your attention to the moment, to the clarity of an open heart, no longer in fear of vulnerability, now able to make the correct decisions about life at a very precarious point in our history. The good news is, and as science now knows, our DNA is more easily changed by our environment, than was previously understood. Your environment is your mind. Change your mind and you will change your world. It is time. And as Paula so aptly illustrates in this book, you (we) can do it! About the Author: An American psychologist who lives in Asia, a Reiki Master for more than twenty five years, Paula Horan Ph.D. (Laxmi Dechen Wangmo) has adapted the best of the East and West to convey ways to calm the mind and raise the life force energy. Drawing on her considerable experience in the Taoist tradition, Advaita Vedanta and the Vajrayana, she has created a succinct set of instructions for cutting through a mind deluded by the appearance of separation and habituated to fear and chaos, to bring it home to a non-dual awareness, centered in self confidence and grounded in the direct experience of oneness. About Paula Horan : An American psychologist who lives in Kathmandu, Nepal and Reiki Master for more than twenty five years, Paula Horan Ph.D. (Laxmi Dechen Wangmo) has adapted the best of the East and West to convey ways to calm the mind and raise the life force energy. Paula is widely known in Asia for her Jnana Yoga, Core Empowerment retreats, which point participants to a direct experience of non-dual awareness, as well as for her special gift with EFT, which helps clear the obstacles that block our ability to be fully present and enjoy life with a true sense of contentment. After spending over twenty years in India, Nepal, and China, where she travels and leads seminars and retreats, she is now available to a wider audience through her online radio show, "Karma Clearing: Complete The Past, Experience Love Now",at www.eftradioonline.com. A recipient of the Inner Flame award presented by former Prime Minister of India, I.K. Gujral, Paula is a bestselling author of 8 books on Reiki, Non-Dual Awareness and Alternative Health. Her latest book, "Fierce Innocence: The Essential Road Map For Living Life's Purpose In Challenging Times", which she also calls her spiritual autobiography, takes her readers beyond mentally repairing their problems, to dropping the "problem" mind altogether. Find out more about Paula's programs at www.paulahoran.com. 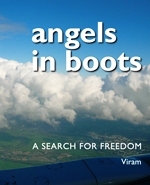 A book with the intriguing title “Angels in Boots” has been published in Mumbai, India. Written by Swami Viram, according to him it is a book beyond rules and regulations and the power of the unreasonable. He added that “The book also contains stories about my life, the various journeys I made from New York to Pune, and from Kyoto to Barcelona. Lots about dance and meetings with unique individuals. “The very best part that happened in my life was getting connected with Osho and taking sannyas. I didn’t know anything about Osho until a friend told me to go to Pune. According to her this was where the best dance center in the world was located. Though I had never heard about Pune and Osho, I trusted my friend, took the plane from New York to Bombay and stayed for 7 years!